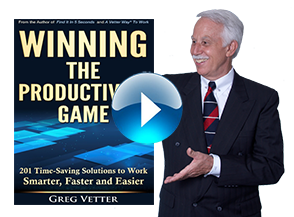 What We Do | Vetter Productivity, Inc.
Are You Haunted By The Day To Day Stress Of Your Job? Do you ever wake up thinking you forgot to clear your e-mails or you missed an important meeting? Is a typical day in your work life a barrage of e-mails, voice mails, texts, and phone calls on top of a meeting agenda that pretty much consumes your entire day? Sometimes it feels as if a good day is one where you simply have the time to get to all of the meetings, clear your e-mails, voice mails and phone calls, and react to the critical communication. But, your organization hired you to do more than that and you know in your heart that just getting through the day is not getting the job done. Companies spend countless hours writing job descriptions describing the “real job” yet these descriptions almost never include going through e-mails, voice mails, texts, and showing up at all of those meetings, as the primary job. The “real job” usually includes evaluation of business opportunities, analysis of metrics, problem identification, and the development of action plans. The “real job” almost always requires an extensive use of your mind to think through issues and apply past experience to plan the best way forward for the business. The “real job” may also require that you spend time with associates coaching and developing the next generation of managers. Given the inundation and onslaught of all types of media, how do you preserve and schedule the quality time required to get the “real job” done? A Vetter Way® is a management system that provides a solution to preserve and protect quality time for you and your entire organization to work on the “real job.” The system provides the methodology to sift through the bombardment of media and data, keep what is important, trash the garbage, and hold onto that which needs more investigation. 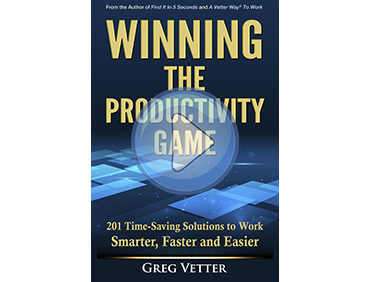 A core concept of the system is developing the ability to clearly segregate the activity of Processing information from the activity of Producing work, and setting up your office to maximize production and minimize processing. If you have the urge to perform the “real job” better, call and talk with Greg Vetter at 404-250-1727. The call is free!